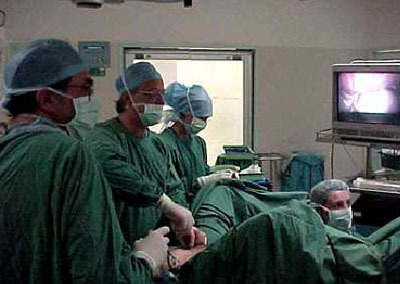 Laparoscopy is a commonly performed procedure to investigate and treat problems in various abdominal and pelvic organs. Laparoscopy involves the direct visualisation of the abdominal cavity, ovaries, outside of the tubes and uterus by using a laparoscope. The laparoscope is a long thin instrument with a light source at its tip. To lights up the inside of the abdomen or pelvis. Fibreoptic fibres carry images from the lens (also at the tip of the instrument) to a video monitor, which the surgeon and other theatre staff can view in real time. 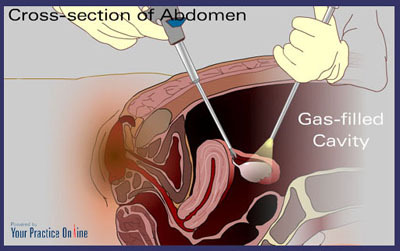 Carbon dioxide (CO2) is introduced into the abdomen through a special needle that is inserted just below the navel. This gas helps to separate the organs inside the abdominal cavity, making it easier for the physician to see the reproductive organs during laparoscopy. The gas is removed at the end of the procedure.